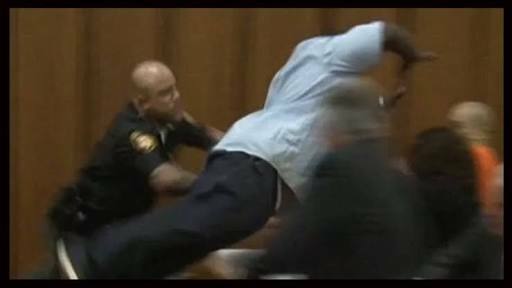 The father of one among st the three girls brutally murdered by Michael Madison launched an attack on daughters killer in court. Shortly after the judge pronounce death sentence on the Ohio serial killer, Van Terry who is the father of 18-year old Shirellda Terry, dived aggressively towards Michael Madison in an attempt to attack him. The bodies of 38-year-old Angela Deskins, 28-year-old Shetisha Sheeley and 18-year-old Shirellda Terry were found in July 2013 near the East Cleveland apartment building where Madison lived. Madison told police he strangled two of the women but couldn't remember killing the third. "Right now, I guess we're supposed to, in our hearts forgive this clown, who has touched our families, taken my child," Terry said. Terry then paused and turned to look behind him was Michael Madison, who was sitting behind the defense table, he then was running towards the convicted killer and lunging over the table at him. Cuyahoga County courtroom deputies wrestled Terry as Madison and others scrambled to get out of the way. The courtroom momentarily burst into chaos, as someone sitting in the gallery repeatedly yelled "No!" and someone else screamed, "Terry!" Mr McDonell said the horrific nature of Madison's crimes far outweighed evidence presented in efforts to spare him, including an abusive and chaotic childhood. May God grant the dead girls eternal rest and console the parents.